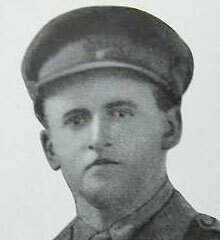 Lewis Dudley Richard Huggard was born at Dungannon, County Tyrone about 1894. He was the son of the Rev. Richard Huggard and Frances Marion Huggard, of St. John's Vicarage, Barnsley, Yorkshire. The family then moved to Dublin and then back to St John’s Vicarage, Barnsley. Lewis and his brother Hewitt both played for Barnsley Rugby Club. 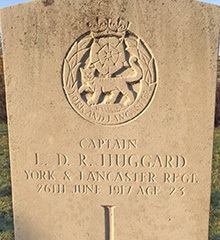 Captain Lewis Dudley Richard Huggard was serving with the 13th Battalion of the York and Lancaster Regiment when he died on 26th June 1917, age 23. 4 UK National Archives Information on Lewis Dudley Richard Huggard can be purchased here. 5 War Graves Photographic Project Photo of Lewis Dudley Richard Huggard's headstone can be purchased here.